We select projects where the need is the greatest and which will benefit the largest number of Hondurans in the Tela community. When each project is successfully completed and established, we turn the operation and maintenance over to the local Tela personnel. Because of the H2HT consistency in Tela, we have seen the lives of thousands of Honduran adults and children enriched because of our commitment. For information about the Humanitarian Service Trip, please email: lindaggilbert@gmail.com. The Hands to Honduras Tela Program is a partnership program bringing together North American and Honduran communities to provide educational, technical, cultural, and humanitarian assistance to the Atlántida coastal region. 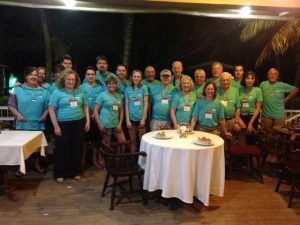 The Hands to Honduras Tela (H2HT) humanitarian service program is all volunteer. There are no paid employees, and all of us dedicated volunteers travel to Honduras at our own expense. Therefore, all funds raised go directly to the H2HT projects All donations of equipment, medical/dental supplies, clothing and school items are given to those in need.